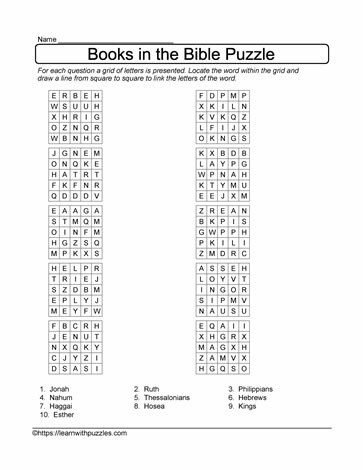 Locate the Bible book puzzle. Here is the new and unique puzzle form for students to complete. Increase vocabulary and activate problem solving skills as students draw lines to join letters to spell out the names of 10 books of the bible. Each word found in the Bible books wordbank below can be found in one of the ten grids provided. Draw a line from square to square to join the letters to spell the words. Suitable for student use in regular classroom, homeschooling and Sunday school environments. Great for students in late elementary grades 4,5,6 classrooms.